tfdbg is a specialized debugger for TensorFlow. It lets you view the internal structure and states of running TensorFlow graphs during training and inference, which is difficult to debug with general-purpose debuggers such as Python's pdb due to TensorFlow's computation-graph paradigm. This guide focuses on the command-line interface (CLI) of tfdbg. For guide on how to use the graphical user interface (GUI) of tfdbg, i.e., the TensorBoard Debugger Plugin, please visit its README. Note: The TensorFlow debugger uses a curses-based text user interface. On Mac OS X, the ncurses library is required and can be installed with brew install ncurses. On Windows, curses isn't as well supported, so a readline-based interface can be used with tfdbg by installing pyreadline with pip. If you use Anaconda3, you can install it with a command such as "C:\Program Files\Anaconda3\Scripts\pip.exe" install pyreadline. Unofficial Windows curses packages can be downloaded here, then subsequently installed using pip install <your_version>.whl, however curses on Windows may not work as reliably as curses on Linux or Mac. Wondering what might have gone wrong, you suspect that certain nodes in the training graph generated bad numeric values such as infs and nans, because this is a common cause of this type of training failure. Let's use tfdbg to debug this issue and pinpoint the exact graph node where this numeric problem first surfaced. To add support for tfdbg in our example, all that is needed is to add the following lines of code and wrap the Session object with a debugger wrapper. This code is already added in debug_mnist.py, so you can activate tfdbg CLI with the --debug flag at the command line. Bringing up a CLI before and after Session.run() calls, to let you control the execution and inspect the graph's internal state. Allowing you to register special filters for tensor values, to facilitate the diagnosis of issues. In this example, we have already registered a tensor filter called tfdbg.has_inf_or_nan, which simply determines if there are any nan or inf values in any intermediate tensors (tensors that are neither inputs or outputs of the Session.run() call, but are in the path leading from the inputs to the outputs). This filter is for nans and infs is a common enough use case that we ship it with the debug_data module. Note: You can also write your own custom filters. See tfdbg.DebugDumpDir.find for additional information. The debug wrapper session will prompt you when it is about to execute the first Session.run() call, with information regarding the fetched tensor and feed dictionaries displayed on the screen. This is what we refer to as the run-start CLI. It lists the feeds and fetches to the current Session.run call, before executing anything. If the screen size is too small to display the content of the message in its entirety, you can resize it. Use the PageUp / PageDown / Home / End keys to navigate the screen output. On most keyboards lacking those keys Fn + Up / Fn + Down / Fn + Right / Fn + Left will work. This list of tensors can also be obtained by running the command lt after you executed run. pt Print value of a dumped tensor. pf Print a value in the feed_dict to Session.run. eval Evaluate arbitrary Python and numpy expression. eval <expression> Evaluate a Python / numpy expression, with numpy available as np and debug tensor names enclosed in backticks. eval "np.matmul((`output/Identity:0` / `Softmax:0`).T, `Softmax:0`)"
ls List Python source files involved in node creation. ps Print Python source file. config Set or show persistent TFDBG UI configuration. Note that each time you enter a command, a new screen output will appear. This is somewhat analogous to web pages in a browser. You can navigate between these screens by clicking the <-- and --> text arrows near the top-left corner of the CLI. To navigate through previous tfdbg commands, type in a few characters followed by the Up or Down arrow keys. tfdbg will show you the history of commands that started with those characters. Use the prev and next commands. Click underlined <-- and --> links near the top left corner of the screen. Tab completion of commands and some command arguments. In this first Session.run() call, there happen to be no problematic numerical values. You can move on to the next run by using the command run or its shorthand r.
TIP: If you enter run or r repeatedly, you will be able to move through the Session.run() calls in a sequential manner. NOTE: The preceding command works properly because a tensor filter called has_inf_or_nan has been registered for you when the wrapped session is created. This filter detects nans and infs (as explained previously). If you have registered any other filters, you can use "run -f" to have tfdbg run until any tensor triggers that filter (cause the filter to return True). # A filter that detects zero-valued scalars. See this API document for more information on the expected signature and return value of the predicate Callable used with add_tensor_filter(). As the screen display indicates on the first line, the has_inf_or_nan filter is first triggered during the fourth Session.run() call: an Adam optimizer forward-backward training pass on the graph. In this run, 36 (out of the total 95) intermediate tensors contain nan or inf values. These tensors are listed in chronological order, with their timestamps displayed on the left. At the top of the list, you can see the first tensor in which the bad numerical values first surfaced: cross_entropy/Log:0. From the summary, you can see that several of the 1000 elements of the cross_entropy/Log:0 tensor are -infs (negative infinities). If you click "node_info" at the top of the screen, tfdbg automatically shows the traceback of the node's construction. 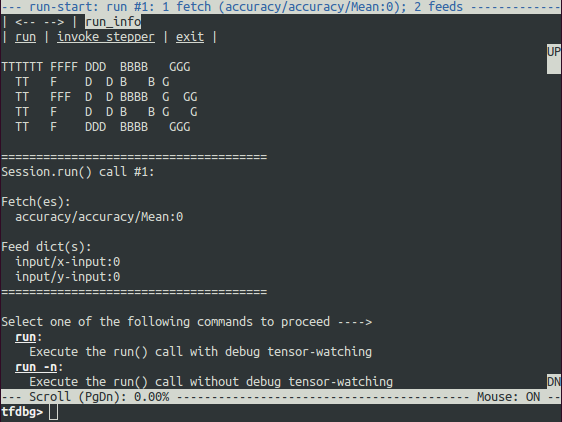 tfdbg has a feature that makes it easy to trace Tensors and ops back to lines in Python source files. It can annotate lines of a Python file with the ops or Tensors created by them. To use this feature, simply click the underlined line numbers in the stack trace output of the ni -t <op_name> commands, or use the ps (or print_source) command such as: ps /path/to/source.py. For example, the following screenshot shows the output of a ps command. 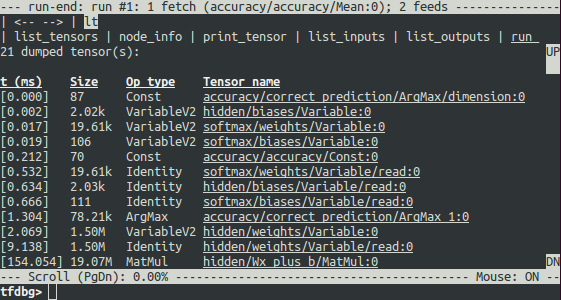 Confirm that no tensors are flagged as containing nan or inf values, and accuracy now continues to rise rather than getting stuck. Success! This section explains how to debug TensorFlow programs that use the Estimator APIs. Part of the convenience provided by these APIs is that they manage Sessions internally. This makes the LocalCLIDebugWrapperSession described in the preceding sections inapplicable. Fortunately, you can still debug them by using special hooks provided by tfdbg. # Create a LocalCLIDebugHook and use it as a monitor when calling fit(). The LocalCLIDebugHook also allows you to configure a watch_fn that can be used to flexibly specify what Tensors to watch on different Session.run() calls, as a function of the fetches and feed_dict and other states. See tfdbg.DumpingDebugWrapperSession.init for more details. # Define your keras model, called "model". With minor modification, the preceding code example also works for the non-TensorFlow version of Keras running against a TensorFlow backend. You just need to replace tf.keras.backend with keras.backend. TFDBG supports debugging of training and evaluation with tf-slim. As detailed below, training and evaluation require slightly different debugging workflows. Often, your model is running on a remote machine or a process that you don't have terminal access to. To perform model debugging in such cases, you can use the offline_analyzer binary of tfdbg (described below). It operates on dumped data directories. This can be done to both the lower-level Session API and the higher-level Estimator API. # Be sure to specify different directories for different run() calls. The watch_fn argument accepts a Callable that allows you to configure what tensors to watch on different Session.run() calls, as a function of the fetches and feed_dict to the run() call and other states. If your model code is written in C++ or other languages, you can also modify the debug_options field of RunOptions to generate debug dumps that can be inspected offline. See the proto definition for more details. Q: Do the timestamps on the left side of the lt output reflect actual performance in a non-debugging session? The profiling mode of tfdbg: tfdbg> run -p.
tfprof and other profiling tools for TensorFlow. Q: How do I link tfdbg against my Session in Bazel? Why do I see an error such as "ImportError: cannot import name debug"? Q: Does tfdbg help debug runtime errors such as shape mismatches? Q: How can I let my tfdbg-wrapped Sessions or Hooks run the debug mode only from the main thread? The above example relies on the fact that main threads in Python have the default name MainThread. Q: The model I am debugging is very large. The data dumped by tfdbg fills up the free space of my disk. What can I do? Make sure that the directory pointed to by dump_root is empty or nonexistent. tfdbg cleans up the dump directories before exiting. Reduce the batch size used during the runs. The first command above watches only nodes whose name match the regular-expression pattern .*hidden.*. The second command watches only operations whose name match the pattern Variable.*. The third one watches only the tensors whose dtype match the pattern int. * (e.g., int32). Q: Why can't I select text in the tfdbg CLI? A: This is because the tfdbg CLI enables mouse events in the terminal by default. This mouse-mask mode overrides default terminal interactions, including text selection. You can re-enable text selection by using the command mouse off or m off. Q: Why does the tfdbg CLI show no dumped tensors when I debug code like the following? the constant-folding would not occur and tfdbg should show the intermediate tensor dumps. Q: I am debugging a model that generates unwanted infinities or NaNs. But there are some nodes in my model that are known to generate infinities or NaNs in their output tensors even under completely normal conditions. How can I skip those nodes during my run -f has_inf_or_nan actions? A: Use the --filter_exclude_node_names (-fenn for short) flag. For example, if you known you have a node with name matching the regular expression .*Sqrt. * that generates infinities or NaNs regardless of whether the model is behaving correctly, you can exclude the nodes from the infinity/NaN-finding runs with the command run -f has_inf_or_nan -fenn .*Sqrt.*. Q: Is there a GUI for tfdbg? A: Yes, the TensorBoard Debugger Plugin is the GUI of tfdbg. It offers features such as inspection of the computation graph, real-time visualization of tensor values, continuation to tensor and conditional breakpoints, and tying tensors to their graph-construction source code, all in the browser environment. To get started, please visit its README.